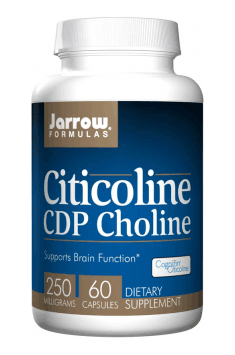 Jarrow Formulas Citicoline CDP-Choline is a dietary supplement with an efficient nootropic and psychostimulant - citicoline in the stable form "Cognizin". Citicoline / CDP-choline (cytidine diphosphate-choline) - a naturally occurring, endogenic precursor of phosphatidylcholine - the main component of phospholipids in cell membranes. After entering the organism, it is hydrolysed to cytidine and choline which cross the blood-brain barrier fairly easily and after that, they play a crucial role in the synthesis and regeneration of nerve cell membranes, nucleic acids and many important proteins. Citicoline is also an efficient substrate for acetylcholine synthesis, which makes it very beneficial for cognitive functions and working memory. Citicoline supplementation protects phospholipids in the brain, inhibits the synthesis of free fatty acids and proinflammatory factors (thus regulating the functioning of the brain), limits the increase of neurological deficits and prevents the occurrence of ischemic damages in nerve cells. CDP-choline also activates neurotransmitters in the brain (it increases the level of noradrenaline and dopamine) and improves metabolism in the brain. Many clinical studies have confirmed citicoline's efficiency in treating neurological disorders of vascular origin, particularly the consequences of strokes, where proper therapy can prevent phospholipid degradation and the formation of free oxygen radicals. Tests on animals demonstrated that citicoline has the ability to limit the extent of brain damage and cerebral oedema, reduce the area of ischaemia around a haematoma and significantly supports motor and cognitive functions. CDP-choline exhibits unique properties which are a combination of psychological stimulation and a nootropic effect. It means that, contrary to Alpha-GPC (one of choline forms) which activates the parasympathetic system connected with resting and regeneration, citicoline activates the sympathetic nervous system, thus contributing to mild psychostimulation and boosting energy and strength to undertake physical or intellectual effort. Moreover, citicoline protects neural membranes, has a beneficial effect in the case of cognitive disorders connected with aging, as well as with Alzheimer's disease. Dopamine is a chemical transmitter in the central nervous system, where it plays an important role in terms of motivation, fulfilling aims and satisfying needs and feeling pleasure, satisfaction and happiness about life. Studies show that CDP-choline prevents the damage of dopaminergic neurons and probably increases dopamine receptor density. To sum up, Jarrow Formulas Citicoline CDP-Choline is a dietary supplement which allows to increase natural intellectual abilities and brain efficiency, which makes it a particularly beneficial product for students, white-collar workers and sportspeople who need a good reflex, concentration and outstanding motor skills. Citicoline CDP Choline 250mg 60 caps. 1 capsule up to 2 times per day during a meal. This product has nootropic properties. It supports learning and memory processes. It is recommended to use before increased mental effort. The minimum recommended dose of CDP-choline is 500 mg (2 capsules), and the maximum dose - 2000 mg. Doses exceeding 2000 mg do not seem to have a more beneficial effect. However, I recommend maintaining supplementation at 2 capsules per day. The capsules may be taken at once or at intervals of 8-12 hours.